Showing results for tags 'lego scale model'. Found this Polish Pm36-1 on Youtube, think its worth looking at! Just found this new video of a Polish Pm36-1 steam locomotive by Fasolic ( @solic ). I've not seen any coverage given to it, and it is a marvellous model, very much got LNER A4 vibes! Love the Dark Blue colour and the integration of full PF in the loco! Anyone know its history? 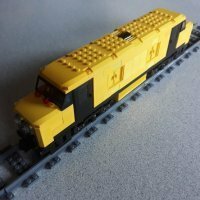 Hello AFOLs, as promised, here’s the passenger coach for my Swedish museum train (if you don’t remember, here are links to the locomotive and the freight wagon). There is no specific prototype for this MOC; instead, I tried to reproduce the characteristic features of several types of wooden pre-WWII Scandinavian coaches. The wagon is lettered as no. 3 of JMJ, a fictional museum railway, which (by mere chance, of course ) uses the same abbrevation as the last Swedish line that operated steam locomotives in regular service. As with my previous wagon models, the roof is detachable, so you can see the fully detailed interior: Tasteful two-tone wall panelling, and a toilet paper roll in the lavatory compartment (see below). The curtains were inspired by those on marbleman’s Orient Express coaches. A shot of the interior during construction: The lavatory compartment, of course equipped with a toilet brush… … as well as a washbasin, a towel roll and a mirror. Some bogie detail, showing the primary (coil springs) and secondary (leaf spring) suspension and the axle-driven generator for the car’s electrical supply: With just over 2100 pieces and a length of 62 studs plus buffers, this is my largest MOC so far. One bench alone consists of 30 parts: I also designed a first-class version of this coach, with only six windows per side and more generous seat spacing; however, due to the lack of time and space, I chose to build only the second-class car (for now, that is). A video of my TGOJ M3a pulling the museum train will follow as soon as there’s sufficient sunlight to shoot it – at the moment, it’s all dark grey here (some of the photos were taken with exposure times > 1 sec)... As always, you will find additional images and larger versions of the photos in my Bricksafe folder. Thanks for stopping by! Best regards, Sven Edit: Videos now available here! Hi everyone, of course, my Swedish tank engine needs some adequate rolling stock, so I designed two different types of cars in 1/33 scale: a four-axle passenger coach, which should be finished in ca. 10-14 days; and the open, two-axle freight car presented here. The model is lettered as no. 1 of a fictional museum railway, which uses the wagon for bicycle transport: As usual, larger pictures and the lxf are available on Bricksafe. When I have completed the passenger car, I will make a video of the whole museum train, too. Hope you like it! Best regards, Sven Edit: Videos now available here!